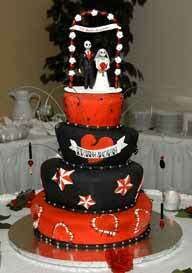 Decorating a cake usually involves covering a cake with some form of icing and then using decorative sugars, candies, chocolate or icing decorations to embellish the cake. 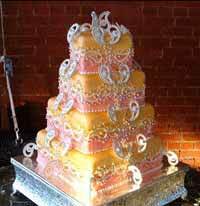 But it can also be as simple as sprinkling a fine coat of icing sugar or drizzling a glossy blanket of glaze over the top of a cake. 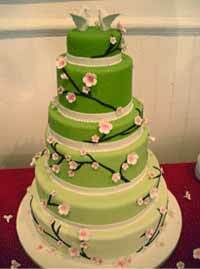 Icing decorations can be made by either piping icing flowers and decorative borders or by molding gum paste, fondant, or marzipan flowers and figures. 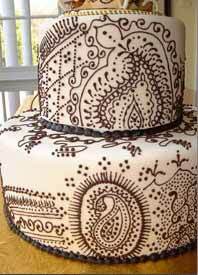 The precursor to most styles of cake decorating is the European style, which entails covering a cake with a smooth layer of icing, either royal icing or rolled fondant, and then using royal icing to pipe flowers, borders and decorative stringwork to adorn the cake. 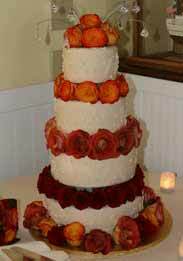 Traditionally, the wedding cake is a graduated multi-tiered cake stacked in Victorian style or separated by pillars with flowers and other decorations applied to each tier. 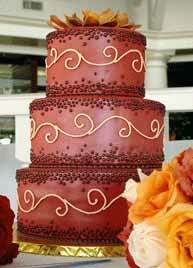 The Lambeth Method uses intricate dimensional overpiping of borders on a fondant covered cake. Scrolls, scallops and stringwork are piped, one layer of icing on top of another, until a very dimensional effect is achieved. 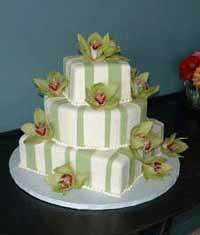 The Wilton Method uses buttercream icing to both cover the cake and then pipe flowers and decorative borders. 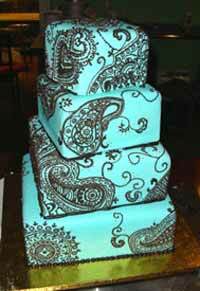 Buttercream, although much tastier than either royal icing or rolled fondant, is much less refined making for heavier and less intricate decorations. 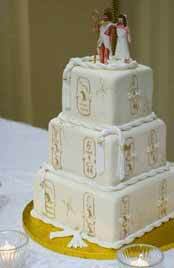 Wedding cake styles have evolved over the years from the traditional white iced cake with icing flowers and a plastic groom and bride on top to highly artistic designs that mirror the tastes and style of the wedding couple. 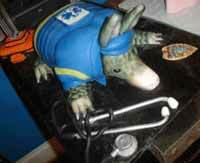 Novelty cakes depicting a favorite hobby, sport, pet or object are in high demand when it comes to making a groom’s cake, retirement, or birthday cake. 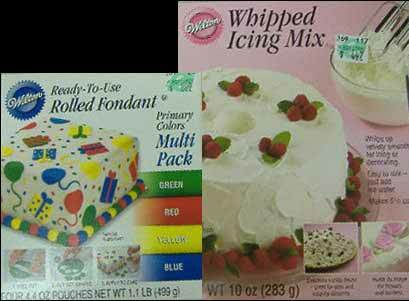 Airbrushing: A quick way to cover a scene or background on the cake’s surface with food coloring using an artist's paint gun used with an air pump (compression). 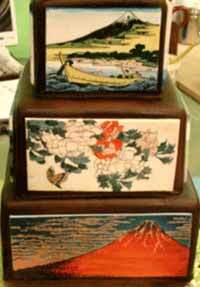 Border: A continuous ribbon of icing used to decorate the top, sides and bottom edges of a cake. 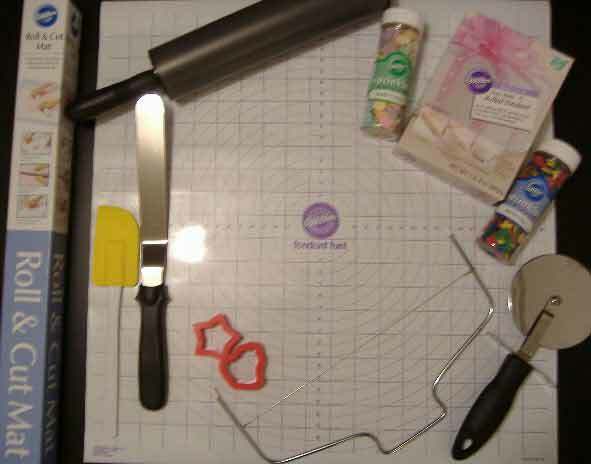 Gumpaste: Edible clay-like dough made by combining glycerin, gum Arabic and icing sugar and used to mold edible flowers and figures. 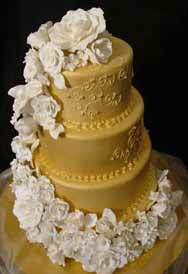 Gum paste can also be rolled extremely thin and used to make intricate ribbons and lacework as well as delicate flower petals. 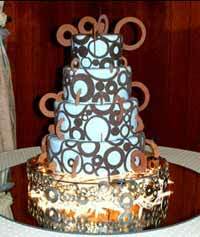 Piping: A decorating technique where a decorating bag or tube fitted with a decorating tip and filled with icing is gently squeezed to produce shaped dots and ribbons of icing to decorate cakes and other baked goods. Decorating Bags: Small triangular shaped bags made from cloth, plastic or parchment paper which are fitted with decorating tips and filled with icing and used to pipe decorative items such as icing flowers, borders, scrollwork and lacework designs. Decorating Tips: Sometimes called nozzles. 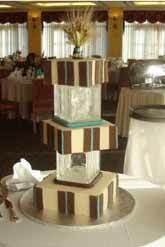 These tips are used to create decorative items such as icing roses, shell borders, basketweave patterns and more. These come in various shapes and are used with an icing or pastry bag so that when the bag is squeezed the icing or cream is piped out in the shape of the tip, which may or may not be the final shape desired. For example, drop flowers are created with a single squeeze, while rose petals are created with skilled maneuvering. 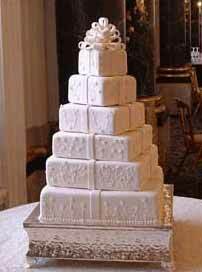 Royal Icing: A sweet white icing made by whipping fresh egg whites (or dried egg whites, meringue powder) with icing sugar. 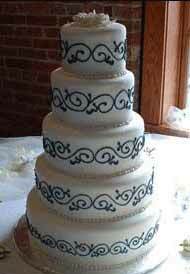 Royal icing produces well-defined icing edges and is ideal for piping intricate writing, borders, scrollwork and lacework on cakes. It dries very hard and preserves indefinitely if stored in a cool, dry place, but is susceptible to soften and wilt in high humidity. 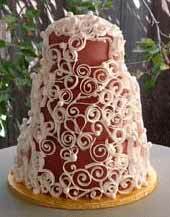 Buttercream: A rich icing made by combining either butter or shortening (or a bit of both) with icing sugar and beating until smooth. 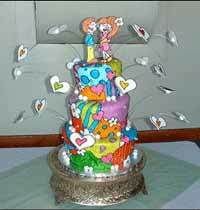 Buttercream is an easy all-purpose icing that can be used to both ice and decorate a cake. 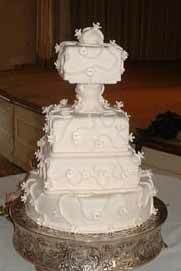 Fondant: Also called sugar paste, fondant is an icing sugar dough which can be manipulated much in the same way as pie dough and rolled into smooth sheets and draped over cakes to provide a flawless finish.